Tunisia is 'committed to defending women’s rights', says President Beji Caid Essebsi. Tunisia is pushing forward with legislation that would give women equal inheritance rights, despite drawing criticism from some Islamic scholars. The UN High Commissioner for Human Rights, Michelle Bachelet, said the Tunisian Cabinet’s recent approval of the draft law is “a significant step towards gender equality in the country, and sets an example for the region”. The draft law, which will now be sent to parliament, has ignited controversy as not only does it break with tradition but goes against a Quranic verse that stipulates men should get a share equal to that of two women. But the news sparked debate across the region, including among commentators at the leading religious institution Al-Azhar University, in Cairo. Saad al-Deen al-Hilali, a professor of comparative jurisprudence at Al-Azhar University, backs the Tunisian move. He issued a fatwa, or religious edict, stating that Tunisia’s decision “is jurisprudentially correct and it does not contradict with God’s words”. But others have disagreed. The Grand Mufti of Egypt has wide-ranging responsibilities. These include reviewing and approving death sentences issued by the country’s courts, and announcing the dates of the key months in the Muslim calendar. His opinion is held in high regard throughout much of the Muslim Arab world. Equalizing inheritance in Tunisia – which would become the first country in the Arab world to do so – would remove one of the legal, economic and social barriers that hold back women in the region. 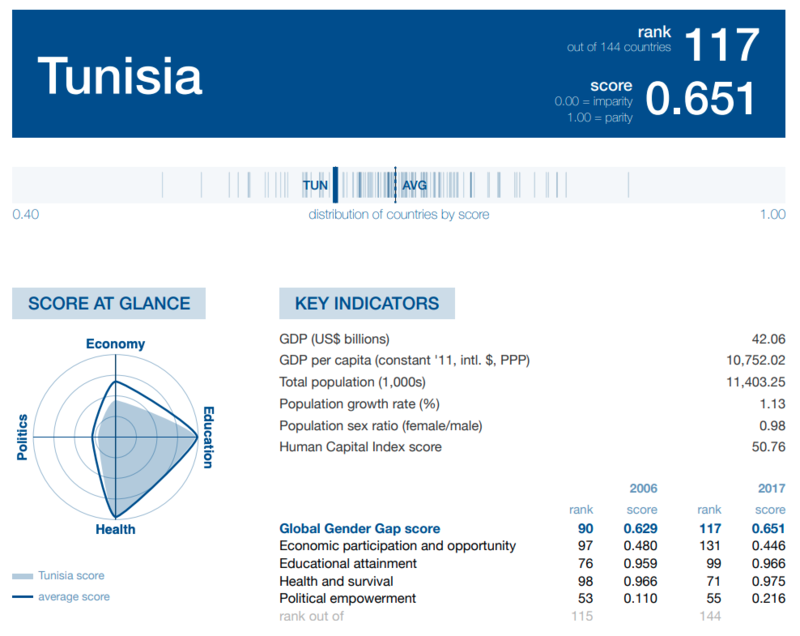 Tunisia is ranked 117 out of 144 countries in the World Economic Forum’s 2017 Global Gender Gap Report. The country has climbed several spots in the report due to greater gender parity in ministerial positions and improvements in basic literacy levels. In 2010, protests in parts of Tunisia were triggered after a 26-year-old street vendor called Mohamed Bouazizi set himself on fire. This act was his response to officials confiscating his goods and subjecting him to violence. Those protests soon escalated and prompted nationwide civil unrest that led to the end of president Zine El Abidine Ben Ali’s 23 years of authoritarian rule, in January 2011. This in turn set the scene for a wave of revolutionary protests across the region, since referred to as the Arab Spring.